As of today, with a little less than half of the 2014-2015 NHL season remaining, the estimated odds of the Oilers getting into the playoffs are approximately 0.008%. They're currently last in their division, and the estimated chance of them staying there is 70.7%. Congratulations on another wonderful season! The only thing the Oilers have going for them is that the NHL draft system gives a bonus to teams that do badly, with the hope of eventually balancing things out. Of course, the Oilers have supposedly been on the receiving end of this for a few years without success, but maybe this time it'll actually work? But exactly how well does does the draft system work for helping the worst teams out in future seasons? I decided to find out. 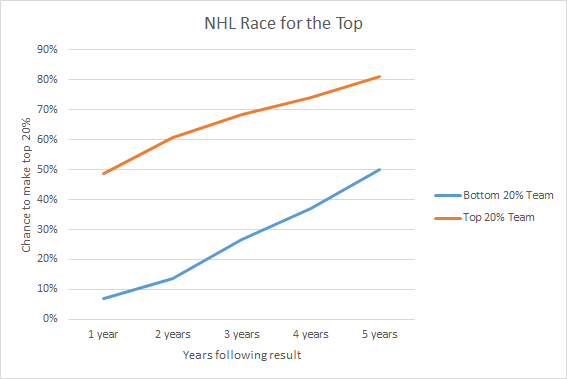 For example, the above graph shows that a team that finishes in the top 20% of the NHL one year has a ~50% chance to make it back in the top 20% within one year, and an 80% chance to make it within 5 years. On the other hand, the worst teams in the league only have a 7% chance to make it to the top within one year, and only a 50% chance to make it within 5 years. Cool, right? This results in somewhat of a different trend. 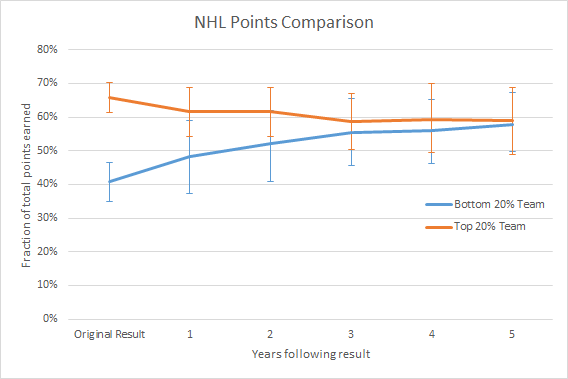 Teams that do poorly have a 2/3 chance of being in the bottom fifth of the NHL again within 3 years, but after that it plateaus and there doesn't seem to be much increased risk of them doing terribly. Also, it's about half as likely for a great team to end up doing terribly at any point within the subsequent 5 seasons as it is for a poor team to do awesomely. Five years later, and there's almost no correlation at all. This is the sort of thing that ought to make Oilers fans happy, if only it weren't for the fact that they've been in that bottom 20% for four of the last five seasons. Ugh. 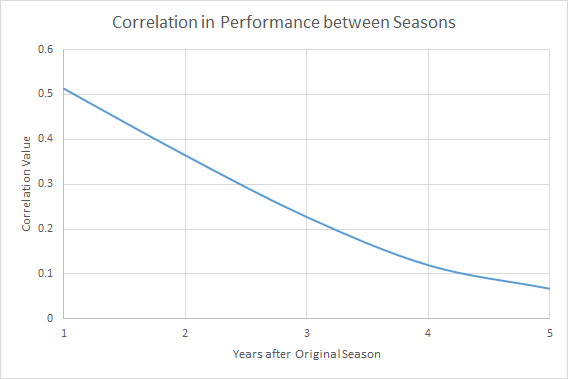 Suggesting that, surprisingly, the best and worst of the league will be statistically equivalent after only 3-4 seasons. So does this give us much of a prediction for when the Oilers will finally start showing up to play real hockey? 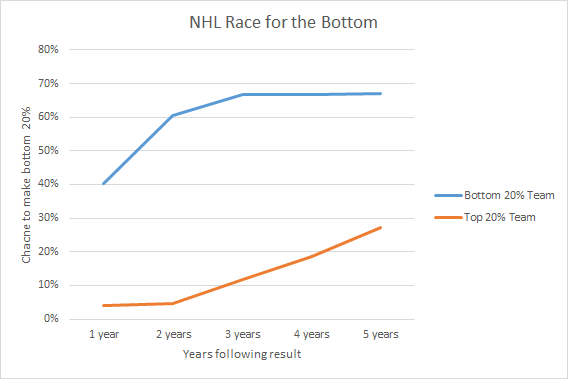 Not really, though historically the trend has been that they ought to have a 50% chance of making it to the top of the league within 5 years, and that they'll be about the same as today's best in the league (eg Anaheim?) within about 3 years. 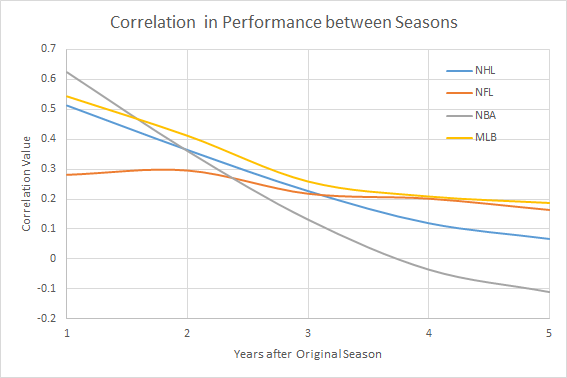 The fact that there's such a variation between sports suggests that there's more to inter-season variation than just random chance, which is certainly promising news for all those coaches and general managers out there. 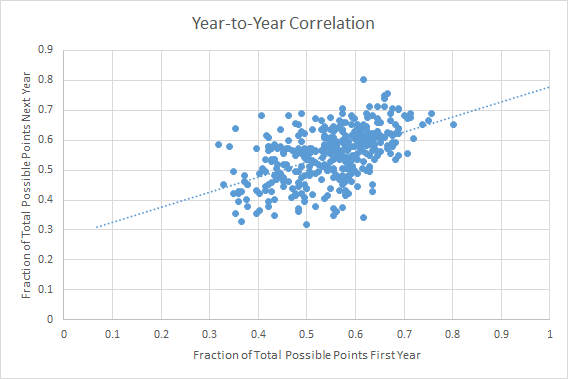 It isn't terribly surprising that the correlation values for NFL are consistently low, since the number of games each team plays is drastically lower than the other three pro sports leagues. 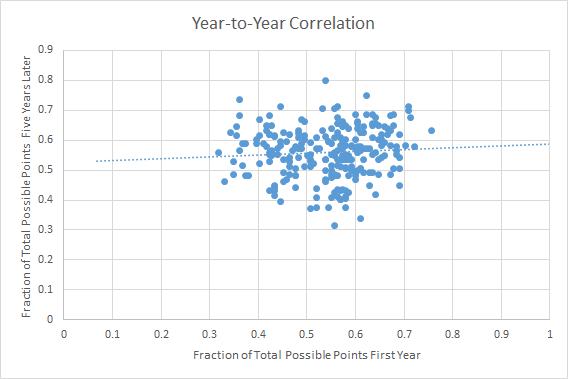 On the other hand, the results for the NBA are rather surprising - teams tend to do almost the exact same one year as they do on the next, but tend to have an inverse correlation five years down the road. If the Oilers had been an NBA team, they wouldn't expect to stay at the bottom for very long. So while this year looks like another dud for the Oilers, there's always hope. Plenty of teams have broken their slumps before, and it's hopefully only a matter of time before the Oilers have their chance.